This was a gold star day in the life of The Golden Child, having announced my presence in the world. I took this big step right here where I live, downtown, before my coffee club. 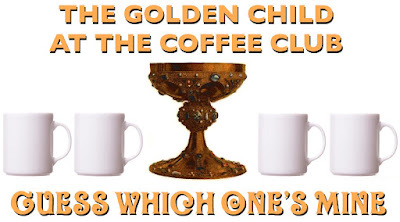 I've drunk coffee with them for years, but never had I said anything this monumental: "Friends, it has come to my attention that the long-awaited child of destiny -- The Golden Child -- is present in the world." Most members set down their cups, a few stroking their beards in perplexity. But I still had to stand and clink my own half empty cup to gain their full attention, with a couple of the rowdier members shaking their table and making a ruckus, as they strained to finish a particularly competitive bout of arm wrestling. "Gentlemen, that can wait! The hour of destiny has come!" I repeated myself about The Golden Child being present in the world, and now they were hushed. Naturally everyone's minds raced far ahead of themselves as they considered my solemn declaration. Was he or she born in the last few hours in Rome, Athens, Jerusalem, or India? In a back alley or dead end in Egypt or Calcutta? Which is always how it is, of course; The Golden Child has to come from somewhere none of us have been. And the extent of our ranging -- except for the veterans who served overseas and swear they'll never go back -- is fairly tight. Silage City, Grundy Rock, or Mingo. The Golden City couldn't be from any of those places, and indeed he is not. I raised my hand in an almost threatening way, like 'this hand is going to smite you,' but I didn't mean it that way. If you consciously had miraculous powers, it seems, you'd have to do 50/50 smiting and saving; one size doesn't fit all. Like to the government: "You guys voted no on universal healthcare, 50% of you will die in the next half hour," instant karma. They're calling ambulances, doctors, etc., but the lines have all been cut, the signals jammed. "No, the lives of others were of no value to you; why should yours be of value? Die like the worthless curs you are!" 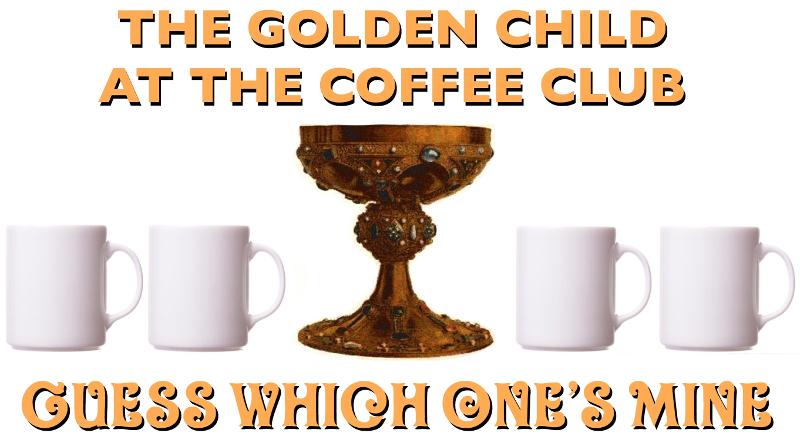 When I raised my hand to the coffee club, all I wanted was to skip the tiresome foreplay. "Gentlemen, you're wasting time in predictable and worthless palaver." They came to their senses. And my cousin Roto stood, his face beaming. He looked at me, smiling, and simply said, "Yes."